The company currently has use of two motorcycles for transporting its engineers to an from a clients site. Motorcycles were chosen as the most appropriate form of transport due to the ability to cut through traffic at will, and park up easily at the Clients site without causing a problem for parking. This was weighed against the obvious danger, but offset by the sheer enjoyment that the engineers felt they would get from riding such machines. 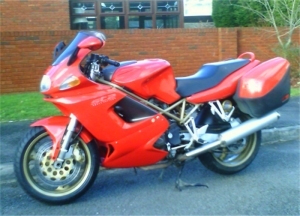 To this end use of a Ducati ST2 has been negotiated along with the purchase of a new Ducati 996 Biposto. 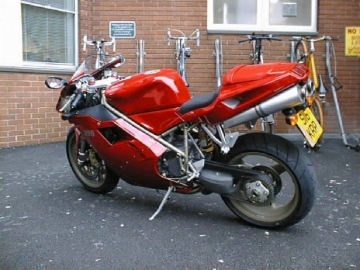 The Ducati 996 Biposto is generally regarded as one of the most iconic superbikes ever made. The World SuperBike series has really put the machine and it's derivatives on the map. Riding this beauty has been fun, she may be hard seated and surprisingly economical, but it just glides along making short work of any leafless corners. We get about 45 Miles Per Gallon, ridden at normal speeds (70-80) and on long motorway journeys it returned 50mpg, a stiff neck and a sore bum. Of all the machines we have tried this is definitely the best though. Things get a bit hard on the neck due to the riding position, and it's also a little hard on the wrists. These are a small annoyance compared to the pleasure of riding it. So far it's only been back and forward to our clients sites, because parking there is a problem. Oh there has been one rather exhausting visit to the Pembrey Race circuit in South Wales. The Ducati ST2 was a replacement for an even older Honda VFR400, It's long been the mainstay of the motorcycle fleet for the last few years. Ester, as she became known, is not the most reliable of machines, it has to be said, (First name terms with the local vehicle recovery teams!) but it's a comfy ride, has decent luggage space in two panniers and can still slip through traffic when required to do so. Road holding is pretty secure, as it's not really that 'chuckable' anyway, but you can still indulge in some enthusiastic bend swinging now and again.